>While the garage floor is not something most people care about as much as the hardwood in the den or the stone tile in the kitchen, there is no reason to ignore its protection. One of the biggest culprits in floor stains and deterioration is moisture. It drips off parked cars, comes in underfoot, and puddles with all types of spills and sprays. These easy tips will help you protect your garage floor from the damage caused by moisture. If no water or other liquids end up on your garage floor to begin with, you do not have to worry about protective coatings or remediation projects. However, since people frequently pull their car directly into the garage from the rainy or snowy streets, avoiding all moisture is probably a futile effort. When roads are icy, take a moment to exit the car and kick the built-up chunks off the wheel wells can help. The secret is top stop melting snow and dripping rain from puddling on the floor and causing problems. 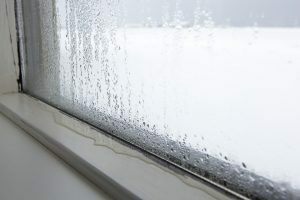 Proper ventilation and dehumidifiers both help dry up the moisture before it causes problems. Pay attention to any puddling and put something under the car to catch the moisture. When many people think of a garage floor, cement or concrete comes to mind first. This is the most common type of floor base used, but it could be damaged relatively easily by excessive moisture. Other options for flooring include paint or spray on coatings and sealants, or coverings like rollout floor mats, and plastic or rubberized tiles. What works best in your garage pens on various factors such as what you store inside and how much moisture you have to deal with. The above mentioned coatings and coverings add an extra layer of protection for your garage floor that could be damaged by unwanted moisture. Coatings – These include moisture barrier sealants, floor paint, epoxy, and other substances designed to keep moisture away from the cement and stains and spills from staining the floor. For best results, apply them to a perfectly dry floor in a series of thick layers. Coverings – These include snap together tiles that are usually made from very hard plastic and rollout mats made from rubberized material. The tiles are more permanent and can withstand heavy loads. The maps can be removed for cleaning if necessary. They are more susceptible to damage from heat, heavy items, or regular use.